Technology amplifies underlying human forces. I realised that with physics you are trying to understand the universe that is not going to change – it exists and the point is discovery – there’s lots of creativity associated with how you discover those things, but it’s convergent, you are ultimately trying to find one solution to a problem. Whereas with computing and engineering, the interesting thing is that it’s diversifying. You are trying to innovate and create things that have never existed, that people have never imagined and may not come into being unless its creators create it. I became a bit tired of working on problems that were only going to help people who are already quite wealthy and can afford a lot of gadgets. So in 2004 I moved to India to help start a new research lab there, and changed research direction to look at how technologies can be used to address global poverty. Initially I thought that we could do projects where some kind of new digital technology would make a substantial contribution to alleviating poverty, to increasing healthcare, to improving education, especially in India’s poorest communities – rural villages and urban slums. But as I did more and more of that work I began to see that it usually wasn’t the technology that made a difference, but who we worked with – our partners…that made a difference whether our outcomes were positive or not. 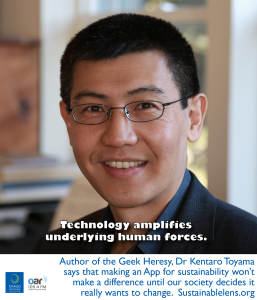 Technology amplifies underlying human forces. Ironically what that means is that often in the very places we want the technology to have a positive impact it fails to gain a foothold because there is either a missing human intention or a missing capacity. The “cult of technology” is the idea that increasingly we are living in a world where we believe that there are technological solutions to just about everything…classically “there’s an app for that”…meaning that there’s a mobile application for just about any problem that you might have in your life. Technology is certainly powerful, and amplification means that for people who have solid education, who have good social ties, who know how to use technology – they can make incredible use of it. But technology’s positive power isn’t embedded in the technology itself, it actually comes from the use that people make of it – which means that ultimately it’s the people who decide whether a technology is going to have a positive impact, a negative impact or no impact at all. In the context of international development, what this means is that exactly in those places where human institutions are not functioning, technology is not likely to help either. Efforts (eg in democracy) are not doomed, work to the extent that they amplifying existing forces towards democracy. Democracy is inherently a political thing, it requires human beings to push for it, argue for it, …those things can be mediated through technology, but it’s never the technology that causes them. Very difficult to find good ways to use technology in areas of abject poverty, not because it can’t be done, but because people are missing other things that they need in order to fully utilise the technology…good solid basic education, politically marginalised without strong social ties to people in power…those constraints make it difficult to use the technology to dramatically change their situation. I’m not saying we should give up on technology…better technology better engine, still need a driver. It is extremely tempting to look for technology solutions for sustainability, certainly there will be technologies that we will have to use to attain a more sustainable civilisation. But ultimately the decisions are very human in nature, and at large scale are political. We have to win those human political fights before the technology will actually have impact. At some level we all know what we have to do to achieve sustainability – we have to consume less, we need to be more respectful of the environment, we need to make sure that the resources we use are being replenished – and while better technologies can help us do those things better, we’re not even taking the most elementary steps as a society to do the sustainability things we could be doing. Which suggests that even if we had great technology, we still might not use them towards a sustainable ends. Again, technology amplifies underlying human forces – as soon as we as a global civilisation decide that sustainability is sufficiently important, I have no doubt that we will use the technology that we have, and invent new technologies that will help us achieve it, but until we make up our minds to chase that, it won’t make a difference if we have the best technologies in the world, we’ll still not use them for the right purposes. I think of social change being primarily driven by a process of human maturation – in the sense of people becoming wiser and better and kinder human beings, we can debate exactly what that means, but most of us have a sense…that there’s a continuum…criminal drug lords…saintly, and there’s a sense of a spectrum of humanity, I think that as people our greatest challenge is trying to move up that escalator, being better versions of ourselves. I think the social change we want to seek is a world where all of us are better versions of ourselves. If we can achieve that, even by increments, then the technology will follow, we will use the technology in better and wiser ways. (Success) Small internal incremental changes – spending more time on work that has social impact, being less concerned with achievements that have public recognition. (Challenges) Trying to make the world a more equitable place. The two biggest challenges of our civilisation are inequality and sustainability. They’re both incredibly challenging problems that I’ll be happy if I can make even a small contribution. (Activist) Generally not, but because my impact is through other people, my students or partner organisations. (Motivation) I think that all of life is basically a succession of moments of consciousness…and each one of those moments has the capacity to be either painful or happy, or somewhere in between. I think that our purpose from moment to moment is to try to make as many of the future moments of consciousness as happy as possible. Those might be my own, but also other people or other forms of life, or other animals to some extent. So to the extent that I can, I would like to ensure more happy moments of consciousness. The questions of sustainability are whether future generations will have the same potential moments of happiness. Are we right now taking massive withdrawals from the potential for human civilisation to continue having happy moments of consciousness at the level those wealthy of us now are enjoying? Technology will help as soon as we commit to sustainability as an issue that is important to us. Until then, it’s not a technological question. (Challenges) I’m very conscious that most of my challenges are internal…I’m aware of a need for comfort, while not doing everything that I can for the goals that I have. I can expect anyone else to change if I can’t change myself in those ways. (Miracle) Everyone to have increase in some percent wisdom. This Sustainable Lens is from a series of conversations at University California Irvine in June 2015. Sam’s visit was supported by the Newkirk Center for Science and Society, and coincided with Limits 2015.